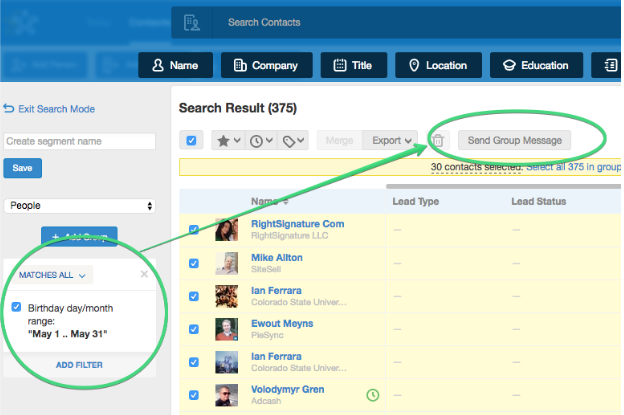 Learn how to leverage our advanced search engine to organize your contacts. 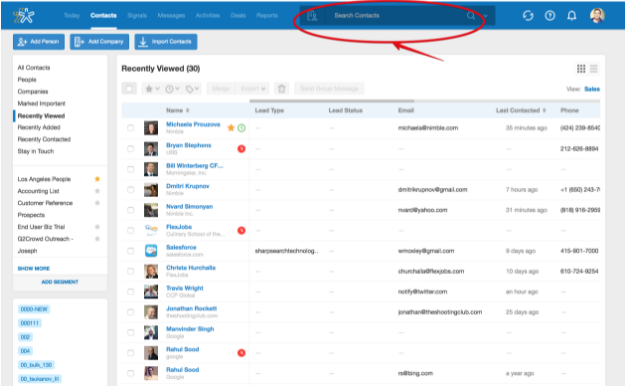 The search engine in Nimble allows you to search across many data fields to help you organize your contacts into lists. Once you've organized your contacts into lists, take bulk actions, send group messages, and set follow-up tasks. To get started, go to the Contacts Tab and bring your cursor into the “Search Contacts” box. 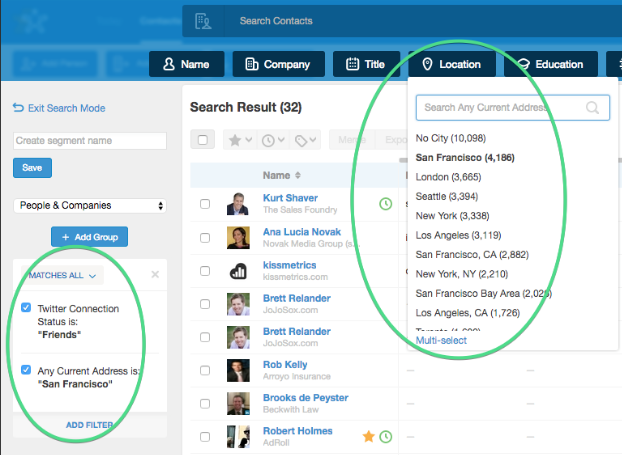 Click on the Search box to bring up Nimble’s Quick Filters. Select a Quick Filter to easily segment your contacts. A segment is a group of contacts defined by the filters you select. Use the "Add Fields" and "Grouping" functions to build smarter segments of your contacts. Contacts are automatically added to saved segments when they meet your criteria. Create Smart Segments with searches that combine social and location data. Ex. “Twitter friends in San Francisco”. Once you build a segment, take actions such as marking lists as important, tagging, Stay in Touch reminders, or send a segment to a Group Message. Learn more about Group Messaging here. Example: Send a Happy Birthday message to all contacts who have a birthday this month. Build and save a segment to come back at a later time. All contacts that meet the set criteria for a segment will appear under this segment. For example, if you create a segment for “Twitter friends who live in San Francisco”, every contact you add and connect with on Twitter from San Francisco will appear under this search. How do segments differ from tags? You can group your users by segments or tags in Nimble, with the key difference being that your users are automatically added to segments when they match criteria, where tags are a manual method to group users together.